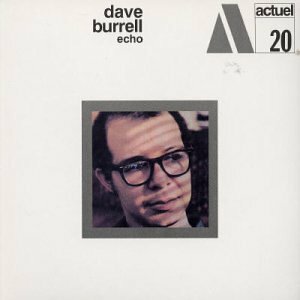 Echo is one of the two tracks on Dave Burrels album Echo, recorded August 13, 1969 in Paris, at Studio Saravah. Released on BYG Records, 1969. Track two is Peace. Burrell had been part of an all-star group led by Archie Shepp that played during the 1969 Pan-African Festival in Algiers. While there, French journalists from Paris were on hand and mentioned to Burrell the possibility recording in the city. Deciding on such a venture, Burrell remarked that he “remembered the sound of the ambulances and the police cars in Algiers and that unstable interval of an augmented fourth and thought that was the interval that I wanted to put into ‘Echo’.” The recording was Burrell’s way of honouring the group, since all were involved in the album.